Wildebeest Camp is a true oasis in Nairobi  the perfect place to relax during your African migration! The beautifully-appointed rooms and deluxe safari tents will be a welcome place to stay in Nairobi before and after your safari. 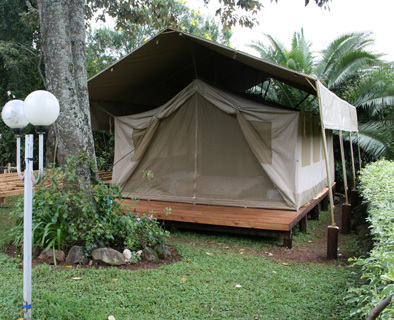 Conveniently located in Nairobi's leafy Karen/Langata area, Wildebeest Camp was Nairobi's first permanent-tented camp - so you can enjoy the unique safari experience from your first night in Kenya! The friendly home-like atmosphere is a great place to meet other travellers, or relax and enjoy the peaceful botanical gardens, which are home to hundreds of varieties of plants and birds. You will be conveniently located close to shops, markets, cinemas, banks and transport links, while feeling miles away from the city bustle. Facilities include: breakfast, snacks and dinner, bar service, internet access, guest lounge, dstv tv, beautiful, relaxing garden, secure compound, 24-hour security officers, guest lockers, hotel safe, laundry. Airport transfer from Nairobi Jomo Kenyatta International airport or Wilson airport to Wildebeest Camp or trasfer from Wildebeest Camp to Nairobi Jomo Kenyatta International airport or Wilson airport.